The article also points out how walking and running barefoot strengthens the feet, helps prevent varicose veins by increasing blood flow in the legs, increases relaxation, and “grounds” you, linking you to the “life force” or “chi” of the earth. There's an entire movement dedicated to this final component, commonly referred to as “grounding” or “earthing”. Earthing the human body influences human physiologic processes. This influence is observed during night relaxation and during physical activity. Effect of the earthing on calcium–phosphate homeostasis is the opposite of that which occurs in states of weightlessness. It also increases the activity of catabolic processes. It may be the primary factor regulating endocrine and nervous systems. In layman's terms, their study shows that earthing affects your body, whether you are resting or active. It builds your bones (which plagues many of us as we age). It can give you more energy, and help your body's natural systems work better. I love any option that can help your body to heal itself for free! It feels good, too. One of the saddest parts of the end of the gardening season is less barefoot dirt time for my tootsies. It's just getting too cold for me to spend too much time with naked feet outdoors, at least most days. I do try and get out from time, and still go barefoot or stocking feet inside most of the time. I do go outside barefoot year round, but in winter I just can't stay out very long! 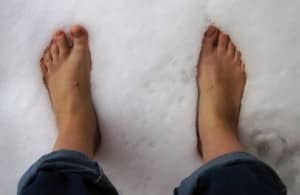 My big ol' feet, barefoot in the snow…brrrrrr…. 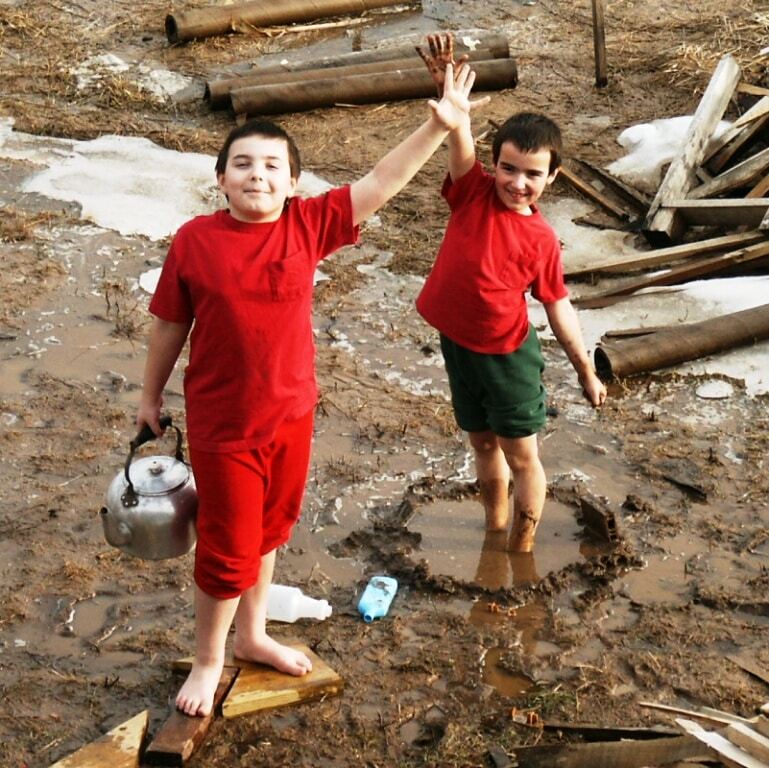 We go barefoot "in" (inside and outside) our house. During late spring through early fall our feet are always dirty. We love it! Alas, I have big feet, and most shoes in my size are either ugly or fit poorly, so it makes going barefoot all that more appealing. 🙂 I have a friend who is considering taking a shoemaking class, so when/if she does, I may have to hire her to make me some comfy shoes. I always loved going barefoot. I can't where we live now, too rocky and we have some terrible thorny things growing. I never wear shoes inside unless it is very, very cold! I am always barefoot. I once ended up at Home Depot without shoes. Goofy. I’m a runner and have only recently found the benefits of going barefoot…and I do have to say I enjoy every second and every little jab of pain I’ve gotten over the last few months. I plan to run the Bellin Health 10K in June barefoot, and even possibly the Fox Cities Marathon barefoot, or with Vibrams on…Truly love the feeling, nothing like it. Good for you! I have a friend who switched to Vibrams and barefoot running and it cured her shin splints. It’s nice to go barefoot, except our free range chickens and dogs just leave too much poop around…. I’m just not that natural…. nor do I have a foot wash by the back door…. but on the nicer days when it’s relatively poop free, sure…. Yeah – too much poo is rather nasty. If you can sneak in some time barefoot, say in the garden, I do recommend it. I read a lot about brain research, and apparently walking barefoot is good for the brain because the extra work done by the feet (more sensitive toe movements for balance, etc.) actually generate more neurons and better connections between neurons. While created for the purpose of walking, this extra brain matter can be used for other cognitive activities. Makes sense to me. I know I pay attention to where I’m walking and how I’m walking more when I’m barefoot. What a great and fun posting. Barefoot is definitely best. I started going barefoot as much as possible back in Nov of 2012 after having pain in the tops of my feet for over a year. The pain went away in less than 2-weeks and I haven’t looked back since. Since then, I’ve gotten into barefoot running and I run an informative page on facebook called Barefoot 4 Life. The .org should get you there as well if anyone wants to check it out. Again, great post. Keep em bare! Do you do youtube videos? I think I may have seen some of your work. The name sounds so familiar. I am 71 years old, I grew up barefooted and to this day, I absolutely hate wearing shoes. As a kid, we were poor but not starving. My brother and 4 sisters were given one pair of shoes a year. The shoes were for school or church. Today, I walk around my house, yard and garden barefooted. If I am mowing I will wear a pair of old worn out sneakers, just for safety. Otherwise, I only wear shoes when I absolutely have too. I have never suffered from any ailments, Yes, I have stumped my toes and stepped on thorns, but my feet are healthy strong and tough. Thanks for sharing your experience, Bill. May I add another comment? My neighbor, who just retired from Chicago is amazed that I walk around barefooted even in the snow. He thinks it is unhealthy and worries about stepping on something unpleasant. My reply is this; I wash my feet after being outside, do you wash your shoes after walking? Your feet sweat, sweat attracts bacteria and fungus. Is that not just as bad as stepping on something? People have become afraid of what was considered normal for millennia.